Courtesy of DFW Urban Realty, LLC, Sandy Maltese. Welcome to Modern Urban Living! 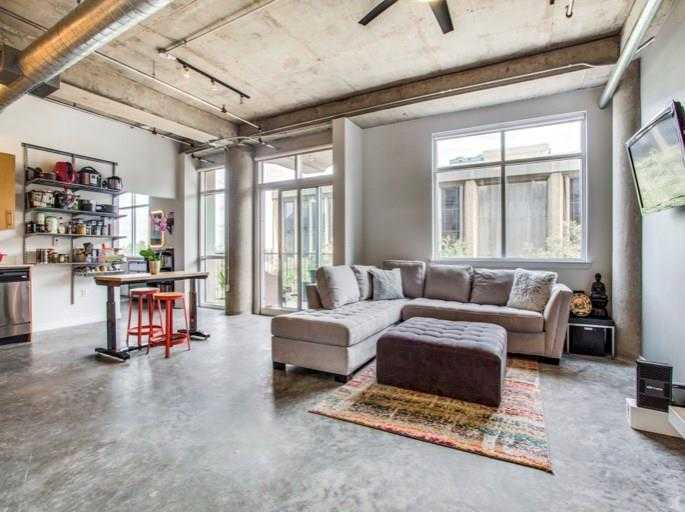 Bright Contemporary Loft Style Condo in Newest High-Rise building located in the Southside Cedars District, minutes away from the DART train, Downtown Dallas, Uptown & Deep Ellum. Industrial Style Unit features High Ceilings, Large Windows, Concrete Floors, Exposed Ducts and a large covered balcony. Limited Access Entry, Gated Parking Garage with 1 reserved space, Saltwater Pool, Jacuzzi, Fire Pit, Grills and Lounge area with views of the city. Dog park is annexed and only steps away. HOA dues $312 monthly includes water, trash,sewage, mgmt fees, Common area maintenance, pool maintenance, blanket insurance of the outside of the building and landscaping! Please, send me more information on this property: MLS# 14020311 – $235,000 – 1001 Belleview Street Unit 302, Dallas, TX 75215. I would like to schedule a showing appointment for this property: MLS# 14020311 – $235,000 – 1001 Belleview Street Unit 302, Dallas, TX 75215.